Copper has been hand forged, hand cut, filed and polished, then blue Lapis Lazuli has been attached with sterling silver. The Sterling Silver ear wires are also hand made by me. 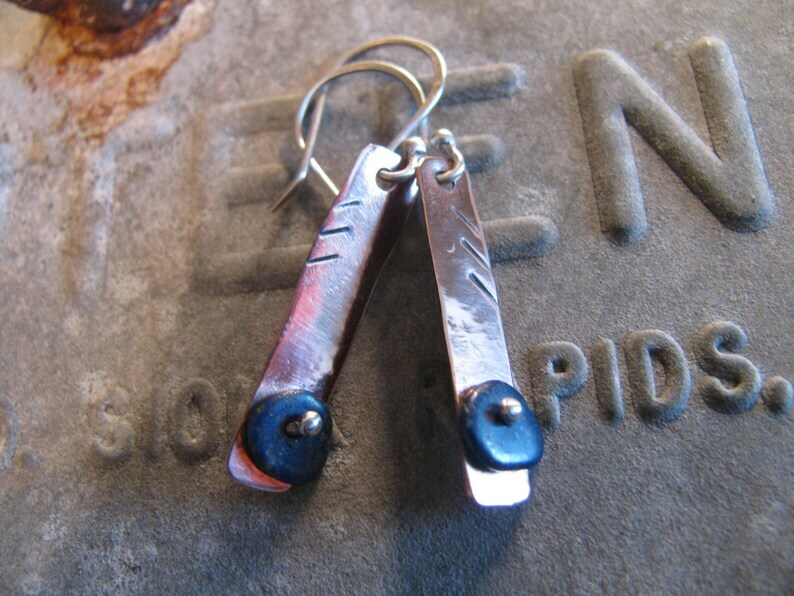 They have been oxidized and hand polished to create the beautiful mixed media art you can wear. Very light weight. Total length from top of ear wire to bottom of dangle is 1 3/4" (4.5 cm). Convo me with any questions or special orders. Earrings ready to ship in a bow tied gift box and organza bag for that special person or you! Great communication with seller. Made me a custom order. Very nice earrings. Thanks! This is our third ring from Toni and they our top notch quality and her customer service is A-1. She is very responsive to any questions. LOVE her jewelry!!! Very nice product. Fast shipping and lovely packaging. Would purchase again. Toni makes the best, most unique jewelry! 3 Sterling Silver Bracelets, Custom order for Joli!!! 100% refund within 30 days on your purchase price if not completely satisfied with your order. 1) Email - Please provide your most current email address in case we need to contact you regarding any order issues. 2) Shipping address - Please make sure the shipping address is correct and complete to prevent any delay in shipment. Toniraecreations is not responsible for any packages sent to an incorrect address provided by the buyer. I ship with USPS First Class Mail to keep shipping costs to a minimum for the buyer. Shipping cost includes tracking information. Domestic orders shipped via USPS First Class mail usually arrive 3-5 business days from shipment date.